Muri Hillside Guesthouses has a range of options on the complex: one-bedroom, two-bedroom, and three-bedroom self-contained, self servicing houses. We can host groups of up to 23 people. The owners live onsite in the upper level of the apartment. Being a family friendly complex we wish to ensure the enjoyment of all guests, and we request the consideration of our guests in respecting that there is no loud noise/partying on the property after 10pm. Overlooking the pool, the cottage has two levels, each self contained, with three bedrooms upper level, and one bedroom on the lower level. With partial seaviews, the upper level has open style living with kitchen and lounge area with TV/DVD, opening up onto private balcony wth outdoor dining. 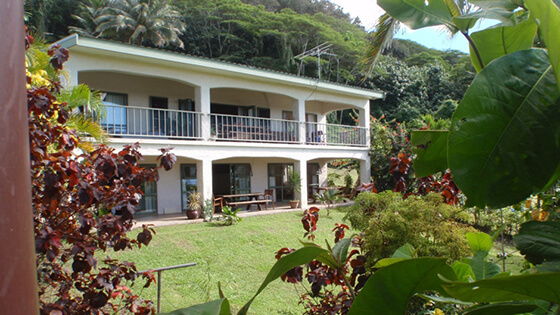 The one bedroom cottage flat spacious TV/DVD lounge area which opens out onto outdoor veranda. Contains double bed in bedroom and single bed in lounge. Both levels have fully equipped kitchens with microwave and 4 burner stovetop. Stand fans, and mosquito screened windows. Perfect for groups of friends or families. 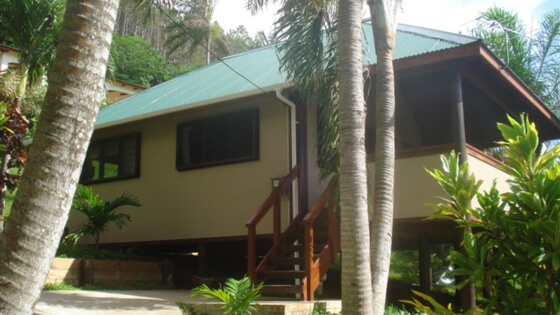 This cosy 2 bedroom self contained bungalow situated near the pool/deck is ideal for a small family or group of friends. Features fully equipped kitchen with microwave oven and 4 burner stovetop. Lounge with TV/DVD opens out onto private verandah. This lovely self contained studio bungalow situated on the hillside above the cottage, is perfect for a couple seeking a getaway. 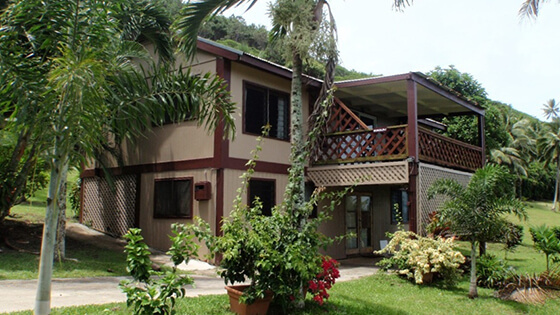 Features fully equipped kitchen with microwave and 4 burner stovetop, looking into living/sleeping area with TV/DVD; stand fan and mosquito screened windows; private balcony with outdoor dining. 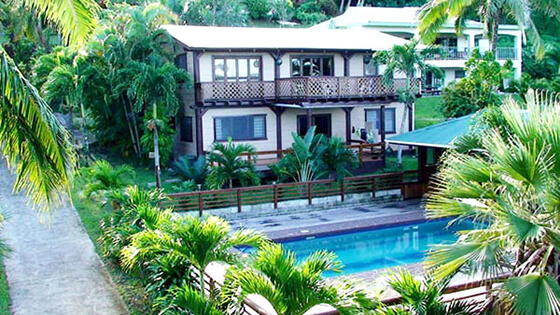 This large 3 bedroom ground floor apartment is ideal for families or groups of friends. Fully equipped kitchen with microwave and 4 burner stovetop; lounge room has tv/dvd. Main bedroom has ensuite facilities. The open style kitchen/lounge opens up to outside verandah stretching across the front of the house. Ceiling fans, and mosquito screened windows.